Eventually, after the destructive flood Kerala is back on the track. Gradually, tourists have started making plans to visit this God's Own Country. So, how about taking up the expedition of exploring an unknown unexplored and hidden spot this season? If untrodden aisles are things that fascinate you, then the picturesque town of Kumily in the Idukki district of Kerala should be your stoppage. As it is known only to a few offbeat travellers, you can enjoy its beauty to the fullest without having any disturbance from the outer world. Well, let's move on and read in detail about Kumily, its mesmerising beauty and how to reach it. The region in and around Kumily experiences a moderate type of climate throughout the year. Hence, it can be visited during any month in a year. However, if you are looking forward to exploring the best of Kumily, then the best time to visit it is from September until the end of April. Kumily is a small town nestled on the beautiful slopes of the Cardamom Hills and is characterised by a cool rejuvenating climate, lush green surroundings, tea estates and rich wildlife. Therefore, it would be cent percent right to say that Kumily is every nature lover's dream destination. 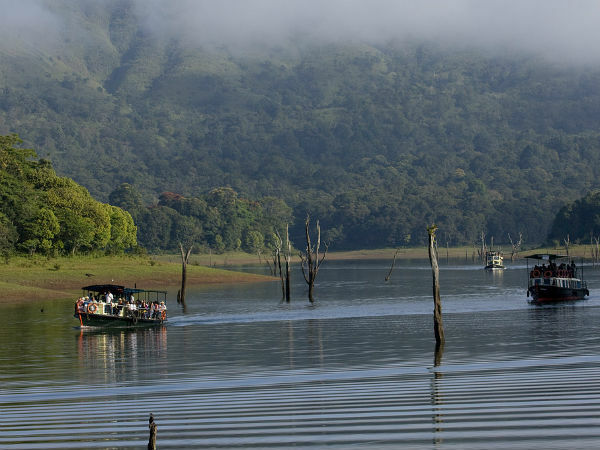 Tucked away in the hilly terrains, it lies in the vicinity of Thekkady and Periyar Tiger Reserve. Even though this small piece of paradise is largely known for its lush environment, it has an age-old history that stretches back to several centuries. It was ruled by the British Empire in the 19th century. Today, Kumily is generally popular amongst locals for its spice and tea plantations and cool and pleasant atmosphere. If you are looking for a destination which is miles away from the tourist crowd and commercialisation, then do consider visiting Kumily. The scenic beauty of this heavenly expanse will certainly leave you astonished. Do you know the region in and around Kumily is blessed with several natural wonders? Yes, on one hand, you can go boating and rafting in the waters of Thekkady and on the other hand, you can indulge in spotting the beautiful wildlife of Periyar National Park. After all, it is located in the midst of hills, valleys and grasslands. Moreover, there will not be tourist to disturb you as you soothe your mind, body and soul in its pacifying aura. If you have been longing for such an untouched beauty, then add Kumily to your bucket list now. By Air: The nearest airport to Kumily is located in Kochi at a distance of about 160 km. Once you have reached Kochi, you can hire a direct cab to Kumily or take a bus to Idukki and then from there a cab to Kumily. Idukki is located at a distance of about 60 km from Kumily and 120 km from Kochi. By Rail: Kottayam railway station is the nearest major railhead to Kumily at a distance of around 108 km. From there, you can hire a cab or use the public transport to reach Kumily. By Road: Being a town, it is well connected to all other districts of Kerala by road. Hence, you can easily approach it by road.